REDDING, Calif. - Dr. Tim Elmore, founder and president of Growing Leaders, a nonprofit that helps develop emerging leaders, will be the featured speaker at the 13th annual Simpson University Business Leadership Luncheon on Tuesday, Aug. 12. 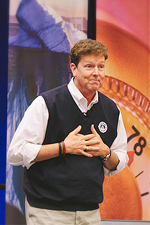 A best-selling author and an international speaker, Dr. Elmore is a leading authority on how to understand the next generation and prepare tomorrow’s leaders. His expertise on emerging generations and generational diversity in the workplace has led to media coverage in The Wall Street Journal, Forbes.com, Investor's Business Daily, Huffington Post, MSNBC.com, The Washington Post, WorkingMother.com, Atlanta Business Chronicle, Dallas Morning News, and Portfolio.com. The event begins at noon in Simpson University’s Heritage Student Life Center, 2211 College View Drive. Doors open at 11:30 a.m. Tickets are $18 per individual, or $180 for a table of 10. Register online at simpsonu.edu/businessluncheon. Seating is limited, so early registration is encouraged. For more information, contact Beth Spencer at bspencer@simpsonu.edu, or call (530) 226-4602. Photo of Tim Elmore from growingleaders.com.